Ages 9 and up. 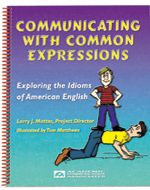 This book includes reproducible pictures and worksheets that can be used to promote both the understanding and the effective use of idioms when speaking in English. Over 200 idioms are included. Idiom Worksheets. Idiomatic expressions are presented within the context of a short story. Each story targets five idioms. The story can be read by the teacher or student. After presenting the short story, discuss the meaning of the idioms and give examples showing how they are used. The worksheet activities provide practice using idioms in sentences. Students are also asked to create stories using the idioms. Idiom Task Cards. This section includes reproducible task cards that can be incorporated into classroom game activities. A situation is described on each card and the child's task is to identify the appropriate idiom from those listed. Large, humorous illustrations are included for some of the idioms included in the stories. These pictures can be used to generate discussions about the meaning of these expressions.